A Second Class at Viva! From the moment we met Heriberto, Rebecca, Parker, Nika, and the rest of Viva’s amazing staff they showed us nothing but kindness and generosity. Over the years we’ve become closer as friends and colleagues. Every third Friday we’re in that beautiful studio to host our Chamuyo milonga, a relaxed night of standing cuddles and views of the skyline. For most of this year we’ve been helping to gently nudge the fledgling tango dancers out of their nests with our 3 cycles of beginner classes. 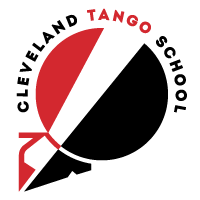 And now The Cleveland Tango School will be offering two hours of class every Tuesday, with the first hour covering parallel system (walking, the embrace, basic musicality, and some easy figures to build on) and the second hour working with cross system (pivots, ochos, turns, training exercises and combinations to explore circularity). The progression of these two tracks is designed to set you up for a healthy, enjoyable, and enduring tango practice. Drop in $16/class – no drop ins starting after 2nd week.